Do you need friendly, fast and reliable plumbers for your workplace? We specialise in commercial and industrial plumbing contracts for schools, companies and businesses. We have great working relationships with our regular customers and carry out testing, repairs and installation of plumbing systems to ensure that your business is compliant with government regulations and your business is protected, along with your staff and customers. We provide maintenance plumbing work for real estate offices and strata management companies. We also provide ongoing maintenance tracking for companies, which takes the stress out of remembering when maintenance checks are due, and keeps you on top of mandatory industry standards. We put our customers first. Because we are friendly, fast and reliable you can rely on us to be a good partner for you. We commonly perform the following jobs for Commercial and Industrial clients. 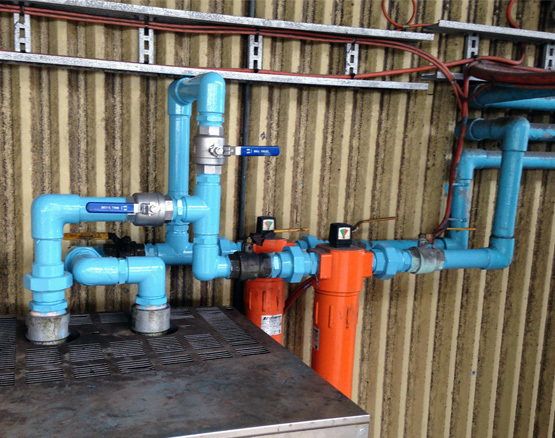 If you require regular maintenance plumbing work for your workplace, make us your trusted plumbers and gas fitters. We can offer advice and friendly, fast and reliable service. Do you test RPZ valves? Yes we can. We can conduct the testing of RPZ valves in your workplace. This is a yearly requirement, which Sydney Water should notify you of in the form of a letter when it is due. What about fire service repairs and replacements? We can install, replace or repair fire safety equipment, or any leaks along your fire line in general. Having fire safety equipment working effectively reduces the risk of fire related incidents at work. Do you do PVC welding? Yes we have the tools to weld PVC. We have a lot of experience welding cracked pipes that are hard to get to, which is a quick repair allowing your workplace to continue operating with minimal downtime. Do you provide regular maintenance services? Yes, we specialise in plumbing maintenance contracts for commercial and industrial companies. This includes schools, strata management and real estate rental management as well as industrial worksites. "We've used Tom for years both for residential plumbing and industrial plumbing. Fantastic. Highly recommend for any job."